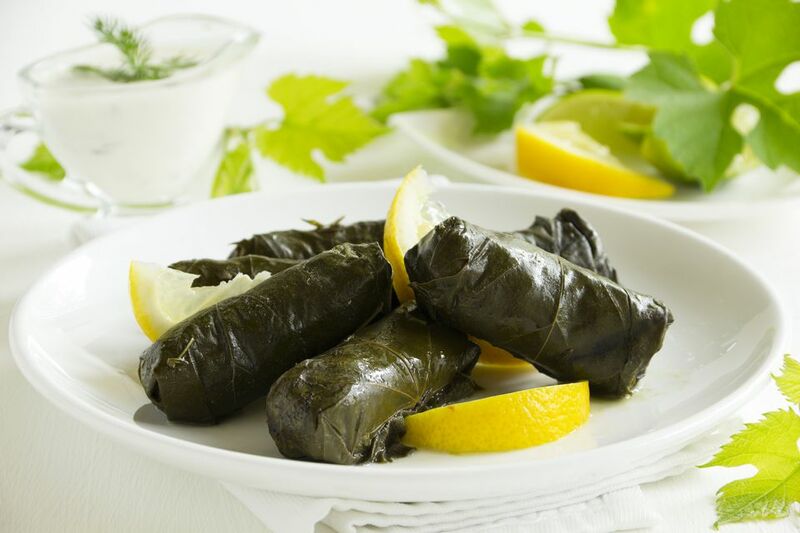 Dolmades — stuffed grape leaves — are a classic Greek dish. Apart from making the stuffing just right, you're faced with the challenge of rolling the leaves properly for a visually appealing finished product. Follow along with these step-by-step directions and you'll be stuffing and rolling with the pros in no time. Parboil the grape leaves for three to five minutes before beginning. Some cooks skip this step but parboiling makes the leaves softer, more pliable and easier to roll. Place a parboiled leaf on a flat surface with the underside facing up and the stem facing toward you. The leaf is on the correct side if you can see raised veins. The shiny side should be down. If the stem is still on the leaf, trim it away using a sharp knife and discard it. Some commercial grape leaves already have the stems trimmed and removed. Overlapping the bottom two sections makes the rolling process easier. This adds a step, but you'll probably be glad you took the time. After you place the filling, you can fold the bottom up as one layer. Otherwise, you can fold each piece individually. Place up to two tablespoons of filling on the bottom center section of the leaf close to where the stem was. Exactly how much you'll use will depend on the size of the leaf. The rice will expand during cooking, so take care not to overfill the packets. Carefully fold the lower right section of the leaf over the filling toward the center. Fold the lower left section of the leaf up over the filling toward the center. Carefully fold the left section of the leaf in toward the center. Fold the right side of the leaf in toward the center overlapping the left side. Begin to roll the leaf up toward the center top point, keeping the filling pressed in a tight log. This is the trickiest part because you can tear the leaf if you press too hard, but after you get past this step you're pretty much home free. Keep rolling up toward the top until you've used up the remaining leaf. The end result should be secure but not too tight, again because the rice will expand while cooking. Make sure it has a little room to grow. When you're finished, tuck the rolled and stuffed leaf in the palm of your hand and give it a gentle squeeze. A Completed Grape Leaf Roll - Congratulations! Place the rolled grape leaves in the pan with the seam side down so they don't unravel during cooking.